The No Child Left Behind Act (NCLB) was famously an ambitious extension of the federal role in public education. The 16 years since it was signed on Jan. 8, 2002, and the two years since its replacement by the Every Student Succeeds Act provide enough distance to begin framing NCLB’s enduring legacy. Certainly, a large part of its legacy will be that NCLB put into law a lasting policy structure for school accountability. However, the ideas behind those policies were not new with NCLB. It cemented approaches already on the rise, but it hardly created them. NCLB also created structural shifts in government control over public schools. 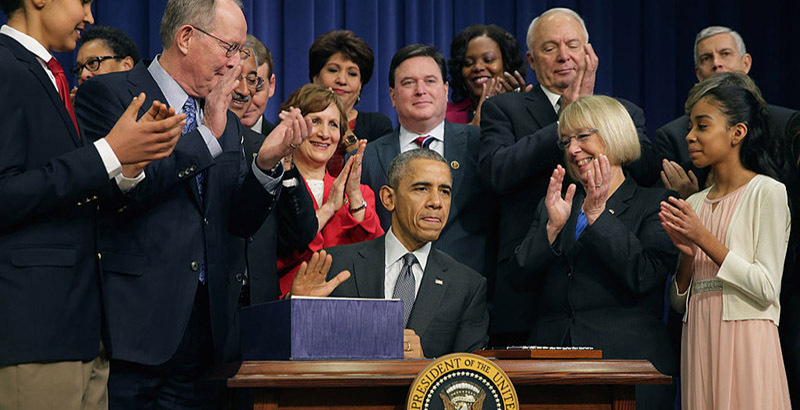 The unprecedented extension of the federal role in education is obvious, but it proved less durable after ESSA deliberately reined in the U.S. Department of Education. So what did NCLB create that will be a crucial part of its legacy? Perhaps NCLB’s legacy may not hinge on what it made, but what it unmade: local control of public schools. Before NCLB, local control was dominant, leaving federal and state governments to supporting roles. NCLB expanded the federal and state roles, and although ESSA has swung the pendulum away from federal power, the authority of states has never been greater, or more important. For better or worse, local control lost out in this zero-sum game, and that loss is likely permanent. America’s public school system was birthed in local control. Through the first half of the 20th century, public schools were financed, governed, and managed locally, with minimal influence from the state, let alone federal, government. But during the second half of the 20th century, federal and state involvement grew in fits and starts, slowly and unevenly toward centralization. As Congress addressed additional national education priorities, it used the same playbook: targeted funding to increase local capacity, while still explicitly prohibiting federal control of education. The Elementary and Secondary Education Act of 1965 (ESEA), later reauthorized as NCLB, provided targeted aid to improve equity for low-income students. Ten years later, Congress passed what became the Individuals with Disabilities Education Act (IDEA), providing funding to educate students with disabilities, many of whom had been denied public education. Each new program generated substantial new administrative duties for state education agencies (SEAs), which grew to accommodate federal programs and route associated funds. Yet the great distance between Washington, states, and local school districts often thwarted congressional intent. For instance, federal Title I ESEA funds regularly ended up in untargeted schools, so the federal government began adding layers of red tape to make states comply with federal intent. Notably, each new law contained its own version of NDEA’s section 102, even as federal involvement grew. Even when the Department of Education (ED) was established in 1980, consolidating federal education authority in one Cabinet-level agency, persistent opposition to federal overreach left ED too weak to compel compliance. Into the 1990s, school districts’ control of schools remained strong, with secondary federal and state roles. The bridge toward the NCLB revolution in federal policy began in earnest with Goals 2000. George H.W. Bush’s work with the nation’s governors culminated in passage of Goals 2000 under Bill Clinton in 1994, which used targeted grants to encourage development of national and state standards with aligned regular assessments, creating the precursors of accountability policy under NCLB. Ultimately hobbled by the enduring defense of local control, Goals 2000 pushed the pendulum of control away from local districts and toward federal and state government. In 2002, the bipartisan NCLB marked a great leap forward for the federal and state roles and, in the zero-sum game of control over schools, a leap back for local control. NCLB flipped the federal policy playbook: Instead of targeting funds with limited requirements, it created targeted requirements with limited funds. Although most of NCLB’s policy ideas weren’t new but gradual forward trends, its requirements were. NCLB not only required states to adopt an accountability system that influenced what happened in schools, but the Bush administration also gave ED the political heft to enforce those requirements. That combination of requirements and aggressive enforcement created a revolution in federal education policy. NCLB also forged a dramatically larger role for SEAs, giving states duties to develop the specifics of their accountability system — ranging from standards and assessments to teacher quality, to defining “adequate yearly progress,” to intervening in failing schools — and principal roles enforcing them. As NCLB unfolded through George W. Bush’s presidency and into Barack Obama’s, more and more schools were labeled as failing and faced sanctions, and the impracticalities of the law became increasingly obvious. With state complaints mounting and no revisions from Congress, the Obama ED offered conditional waivers from NCLB’s sanctions, which allowed relief from NCLB in exchange for the adoption of a variety of the administration’s education policy preferences, which included even more specific and centralizing changes. Bush’s and Obama’s approaches under NCLB held important aspects in common. Both pushed centralization without direct control of local schools. Both increased federal proscriptions of the mechanics of school accountability. Both primarily governed with more stick (through either the threat of held-out relief from sanctions and funding challenges) than carrot. And both pushed too far, inviting a course correction. Federal power in education hit its zenith toward the end of the Obama years, and opposition was ratcheting up. Opposition culminated in another, long-delayed, bipartisan ESEA reauthorization: the Every Student Succeeds Act (ESSA). ESSA deliberately restricted the administrative authority of the secretary of education and rolled back several of the more invasive NCLB requirements, and many hailed it as a return to local control. But was it a return to local control? ESSA certainly pushed the pendulum of authority away from the federal government, but only as far as the states. ESSA retained much of NCLB’s accountability structures, which had already hinged on state execution and were now more than ever defined by state authorities. Investing power in the states leaves local districts subject to determinations from state capitols. Perhaps then it was a return to state control. In the zero-sum game of power, the rise of the states means the autonomy that local districts had before NCLB, and the indifference they could show to dictates from above, is relegated to the past. Surely districts retain significant roles deciding how schools are run and what they teach, but for good or ill, their roles are far more circumscribed than they were last century. In the interest of accuracy, calling ESSA a return to anything is a misnomer, because state authority over education has never been greater than it is today. States’ authority remains in federal law, securing their duty to define the goals, measures, supports, and interventions schools face, with little substantive federal oversight, if ED’s ESSA reviews are to tell the tale. This ascendant state authority is a new structural arrangement and a central feature of the legacy of NCLB. With their elevated roles cemented in federal law, and a further devolution unlikely to come through Congress, state control of education is the new normal. The merits of this new normal are debatable. Federal overreach in education can quickly become problematic on both functional and constitutional grounds. Surely in hindsight, the excesses of the Bush and Obama approaches provide examples of the former and good reason for the latter. The great distance between Washington and 100,000 public schools presents daunting implementation challenges — challenges that can produce serious unintended consequences like the Atlanta cheating scandal and Chicago’s suspect graduation rates. However, it’s a mistake to ignore the positive results of federal intervention, including resources for low-income students, access for students with disabilities, and the attention and data focused on unacceptable achievement gaps. Local control’s chorus of defenders are armed with very good arguments, chief among them the local capacity for nuance and responsiveness to local concerns. However, history suggests that left alone, local authorities will ignore some vital concerns championed at the federal level. Local control is important, but an overreliance on the pluribus can underserve the unum. So elevated state authority may be the delicate balance we need in the control of education, but it brings its own challenges. One is whether states and SEAs have the capacity to match their new roles. SEA capacity varies; it’s uncertain how well they will transition from facilitating federal intentions to developing and directing their own. Whether they have, or can get, the resources, staffing, and expertise to run functional accountability systems will shape the trajectory of public schools for the foreseeable future. States have shouldered these new roles in developing ESSA plans, and the mixed reviews they have received mark how difficult that work is. Another challenge will be whether states can effectively corral districts without causing more of the unintended local responses that stemmed from federal overreach. Though closer than Washington, D.C., the distance from state capitols to school districts can still introduce problems. Springfield, Illinois, is far enough from Chicago to set the stage for more dubious graduation rates. The state government in Atlanta is far enough from Atlanta’s school district to risk another cheating scandal. A final challenge is the variation across states that will come with devolving the federal role. While some states’ aggressive accountability postures may comfort federal officials, others are bound to disappoint. The same variation existed in the years since 2002, but the federal government was working on the case. With the reins firmly in state hands, many will have to adjust to these state differences and take up education reform challenges in state capitols. Whether or not states are up to the task, or whether the nation will be satisfied with the results, the lasting legacy of NCLB has centered the responsibility for education on the states. Nat Malkus is a resident scholar and the deputy director of education policy at the American Enterprise Institute, where he specializes in K-12 education.